Last night, the talents of film and television came together, uniting as one to celebrate the incredible, exciting past year in entertainment. Actors dazzled under the stage lights, supporting their peers and the remarkable entertainment industry, as a whole. No matter comedies or dramas, movies or television shows, there was this undeniable sense of coming together, of enjoying the moments that they, as actors, have all shared and experienced together. With spirited acknowledgment and heartfelt remembrance, the night was warm and full of delight. Last night, the talents of film and television came together for a magnificent show–the Screen Actors Guild Awards. And last night, fashion was out for all to see. Sandra Bullock looked absolutely fantastic at the SAG awards. Her Lanvin gown was stunning in its breathtaking combination of timeless, classic design and bold modernity. There was an unmistakable originality to the creation. The large, glistening bow and high, fresh slit were fascinating together–the past was used in unison with the present. With a vibrant emerald color and a shining material, Bullock did not shy away from taking a risk and wearing something strikingly elegant. Paired with glistening golden heels, the look was fantastic! This purple sequined, form-fitting Dior gown sparkled colorfully and magically on Jennifer Lawrence. The dress was a shining creation of beauty and elegance. The dress was a joyful creation of fun-filled kaleidoscopic hues. Lawrence walked down the red carpet in a strapless design that made her glitter. Timidity did not exist in this excellent look. Reticence was not the goal. A fearless energy was there. An energy that was left to glow and make a statement. Jennifer Lawrence, with her sleek, short hair cut and strong earrings, looked great in this radiant design! 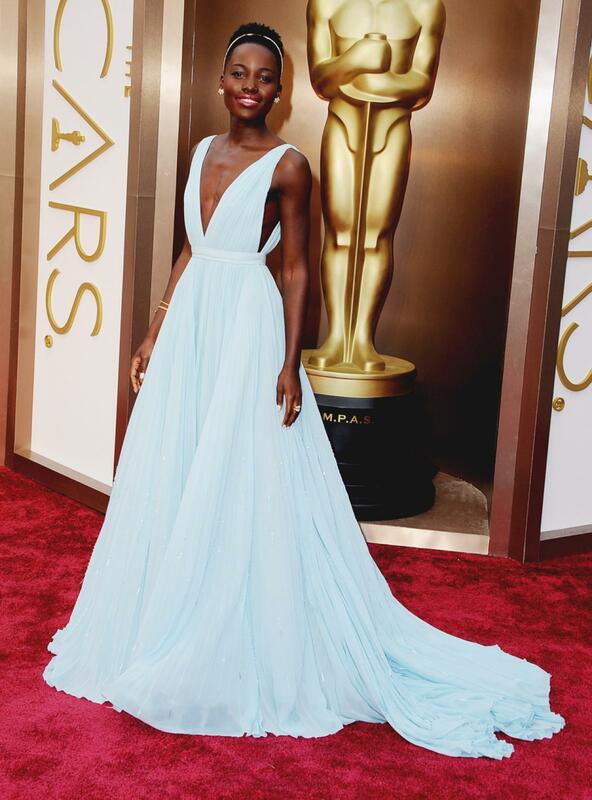 Lupita Nyong’o looked magnificent in this bright, turquoise fitted Gucci gown. This design was simply extraordinary in its standout color and intricate ornamentations. The enchanting turquoise hue lacked fear and had much beauty. The bold color gave the gown a voice. The gold accented, flowered encrustations on the upper half of the gown allowed the dress to leave the ordinary and delve into something exceptional. The detailings added something spectacular to the fluid gown. Lupita Nyong’o shined in this terrific, special design! There is always a thrilling feeling when award season begins once again. There is this unmistakable excitement, this anticipation to see the latest runway looks and custom-made creations glisten in their beauty and brilliance as they move on the powerful red carpet in an environment of wonderful talent. Something magical happens when award show gowns boldly reveal themselves for the world to see. Their glittery ornamentations sparkle in the sun’s rays. Their sleek cuts boldly move in their daringness and unwillingness to settle and conform. On the red carpet, designers are able to show their incredible talents–the creative minds of fashion can create memorable moments and have their voices be heard. On the red carpet, designs are able to fully thrive and prosper–fashion has the opportunity to show how powerful and meaningful it really is. And last night, this is exactly what designers and fashion did. Margot Robbie looked effortlessly chic in this sleek, inviting off-white Gucci gown. With a simple smoothness and powerful fluidity to the design, Robbie undeniably radiated and flowed on the red carpet with each step she took. The deep, perfectly cut neckline and high slit in the front only heightened the gown’s and Robbie’s strikingness and style. The breathtaking crystallized accents and emerald gems that lined the upper half of the gown only heightened the look’s overall power and shine. With matching emerald hued heels and bright, dazzling earrings, the beauty of the gown only rose greater. Margot Robbie was beautiful and dauntless. An edgy, dark look of dazzlements and intricacies…A glistening, glossy gown of geometric, Art-Deco beading and black and burgundy hues…Elisabeth Moss was marvelously fierce in this breathtaking J. Mendel gown. Looking towards the past, while also looking towards the present and future, this dress was breathtaking in its ability to take elements of modernity from the changing, jazzy times ago and pair them with elements of modernity in the world today and in the approaching years. With her short, fearless haircut, loud lipstick, and sharp golden jewels, Moss exuded a secure confidence in this wonderfully detailed, fitted creation. Cate Blanchett was absolutely stunning in this black lace Armani Privé gown. There was something so magnificently unique about this intricate design, something so daring, something so wonderful about its memorable artistry. The dress was of a dark romantic nature–with its mystic, seemingly antique lace details, with its heightened, finely netted floral neckline, with its sheer cap sleeves, and with its alluring atmosphere of intrigue. The low, fearless open back of the striking gown only added to the vigor and captivating exquisiteness of this look. Cate Blanchett’s talent and beauty shined for all to see. The fashions that graced the red carpet during the Golden Globes yesterday were simply remarkable. Continuing on with the award season for this year, the Screen Actors Guild Awards (SAG) recognized and embraced unparalleled talents in both the television and movie industry. It brought together members of a united community of both incredible ability and steadfast determination; outstanding transformation and unforgettable emotion; individualistic style and dazzling spirit. Praising the beauty of acting and acknowledging the powers of a determined union, the Screen Actors Guild Awards gave off feelings of a welcoming warmth, an intriguing uniqueness, and an evident power. The Screen Actors Guild Awards also gave off fashions of immense style and both sparkling and simplistic grandeur. Nicole Kidman looked absolutely breathtaking in this sparkling Vivienne Westwood, couture gown. With sequined, glittering blue details, sheer, seductive energies, dramatic, floral applique intricacies, and confident, thigh-high slit cuts, this piece of couture was magnificent. Glamour radiated off of Nicole Kidman on the red carpet, making her glow. The look was enchanting in its modern elegance, bringing with it an air of both sleekness and regality; it was majestically contemporary. It was truly bewitching. Kidman looked fantastic. A gown with beautiful, lush satin that shined perfectly. A gown with a dark blue high-low skirt that challenged commonality and welcomed spontaneity. A gown with a tightly alluring, ivory silk bustier that added a magnetic thrill. A gown with a smooth, flowing bow, that added a playful vibe. This Dior Haute Couture gown on Marion Cotillard was effortlessly chic. It was harmonious in its simplistic color-blocking design and fluid texture. It was outstanding in its differences, in its unique, architectural sovereignty. Flowing on the red carpet with a beautifully ruffled, navy train, this dazzling Zac Posen gown looked extraordinary on Amanda Seyfried. This mermaid silhouetted, dark-hued creation is one of enormous appeal, skillfully emphasizing Seyfried’s shape, wonderfully allowing Seyfried’s alabaster skin to shimmer. The gown connected simplicity to loud substance; gracefulness to energetic force. And the long, diamond, Art Deco necklace only added to the look’s tremendous appeal. Amanda Seyfried made both her vigor and charm seen to the world. The actors and actresses were seen and their voices were heard. The designs worn on the red carpet were seen and their stunning qualities were felt.